Math Mammoth Addition 1 is a self-explanatory worktext, dealing with the concept of addition and addition facts within 0-10 (in few occasions numbers between 10 and 20 are used). The book is most suitable for first grade. I have also made a set of videos that matches the topics covered in this book. Free addition worksheets for grade 1 — includes single-digit addition, double-digit addition, adding multiples of ten, and missing number addition problem worksheets. I purchased the Blue books and am using them to homeschool my six year old daughter. She has no previous math experience and has only homeschooled. We have been using the Addition 1 and Place Value 1 books mostly. I give her a page or two at a time and we go over what needs to be done. Then she completes the pages on her own and we review them together the next day. One of the things I like about Math Mammoth is the many different ways a skill is practiced. Grace has a much better grasp of addition than I did at six, partially because of all the different kinds of practice she gets. I am SO THRILLED at how well my daughter is doing with her math now. She is in first grade, and we've been using Horizons all year. We've tried a few other programs, and I was mostly happy with Horizons. The only thing we had trouble with was the part of the lesson where you skip count every day and the 5 minutes with flashcards to memorize addition facts. My daughter HATES flashcards, and I felt like this exercise (along with the skip counting for numbers like 4,7, etc.) was going in one ear and out the other. She would recite and not retain. It was not working for us, we both began to dread it, and I finally stopped doing it. I figured as long as she could count quickly on her fingers, then she would eventually learn the basic addition facts. But it started getting harder and harder to get by on that, she was getting frustrated, and math was beginning to go from her favorite subject to her least favorite. So I got your Addition 1 blue book to take a break from Horizons and work on math facts. We have been so happy with it, that I went ahead and bought a few more blue books to cover the rest of the year, and I'm switching completely from Horizons! I love that it doesn't require a lot of instruction on my part (I have a 4th baby on the way, and this is a HUGE plus!) and that she gets enough practice on a topic at one time. I understood the reason behind the spiral method, but it just wasn't working well for us. And my daughter resisted boring "drill sheets." I used the number rainbows for the lower numbers, so she could get the idea of the number families [from Add Subtract 2-A book] and we've been playing the card games as well. She was so close to knowing her addition facts, but she hadn't really stopped to think about them--she was just trying to get through each day's assignment (before). Now, I really feel like she's getting it. Breaking them down into each number family has really helped--Horizons didn't do that. And I think she likes it that there isn't this big session of instruction. She doesn't have to sit through something she already gets, and can ask me questions if there's something challenging. I think she really likes the independence of it. I plan on getting the Grade 2 curriculum next year--you've converted us! I can't believe I've paid so much money for these complicated and time-consuming math programs in the past. 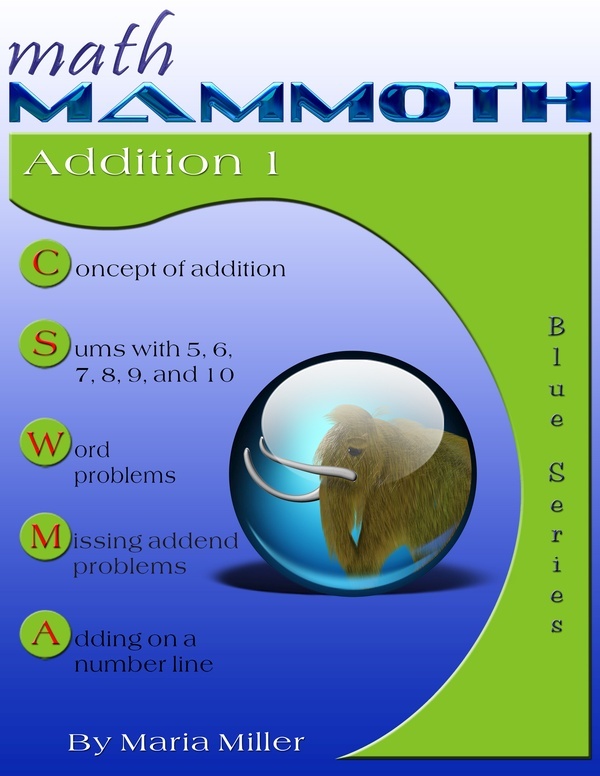 Math Mammoth really is a gem and I'll be spreading the word.